There's honest pleasure in knowing the food we eat is tasty, wholesome and made with real ingredients. Spicentice is all about creating a home-cooked experience, to share with family and friends, with traditional recipes that have been perfected over generations. The clever little (no waste) packs of 100% pure herbs and spices come with an easy to prepare recipe that serves four and a shopping list of the extra things needed to make your favourite dish. 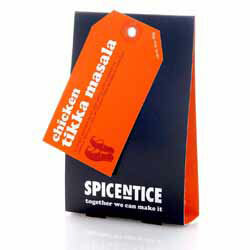 Each Spicentice Chicken Tikka Masala Curry Kit Contains Paprika, Ground Cumin, Ground Coriander, Chilli Powder, Garam Masala (Ground Cinnamon, Ground Black Pepper, Ground Cloves, Ground Cardamom). No additives, no preservatives and no colouring. 1. Peel and finely chop the onions, garlic and ginger. 2. Cut the chicken into bite-size pieces and mix it with the contents of the marinade Sachet, ½ tsp salt and half the chopped garlic and ginger. 3. Leave to marinate for 30 mins or more. 1. Lay the chicken out on a baking tray and place under a hot grill for 3-5 mins each side until the pieces are charred around the edges but not cooked through. 2. In a large saucepan add the oil and fry the onion over a medium heat. As the onion browns add the remaining ginger and garlic and continue to fry. 3. Now add the tomatoes with contents of Sachet 2, ½ tsp salt and 1 tsp lemon juice. 4. Add the chicken and gently simmer for 10 mins with a lid on. 5. Stir in 100ml fresh cream and add 50ml warm water if the sauce is too thick. 6. Cook for 5 mins until the chicken is tender. 7. Check the seasoning and serve with fresh coriander, rice or naan bread. Serve with... Scoop up the creamy sauce with Spicentice Pilau Rice and Naan Bread. Try not to serve this 'British' Indian classic with chips (unless you really can't help yourself). But absolutely no ketchup! "Dear Spices of India, Excellent service, delivered on the agreed day and very well packed. Even included a surprise extra! Very impressed and can highly recommend."